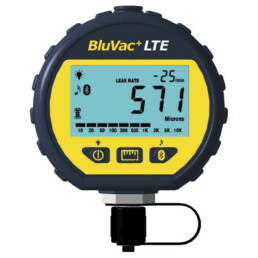 The AccuTools® BluVac+ Pro Wireless Digital Vacuum Gauge is a state-of-the-art wireless digital vacuum gauge utilizing patented technology to deliver the highest accuracy and resolution available. The AccuTools® BluVac+ Pro Wireless Digital Vacuum Gauge is a state-of-the-art wireless digital vacuum gauge utilizing patented technology to deliver the highest accuracy and resolution available. The BluVac+ Pro has Bluetooth Smart® wireless capability, an Evacuation Progress Indicator, Saturation Temperature Display, and a Leak Rate Indicator in either units/second or units/minute. The BluVac+ Pro can be operated stand-alone or in conjunction with an iOS or Android compatible app. 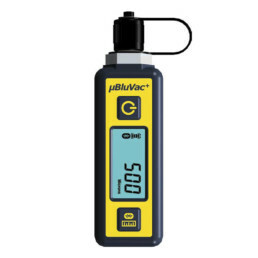 The BluVac+ Pro’s unique Rise Time Analyzer can consistently ensure proper evacuation, providing a PASS or FAIL indication in as little as 15 seconds. This eliminates the need to wait for the completion of a manual rise-time test. 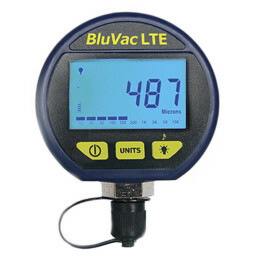 Operating for up to 300 hours on a single 9V alkaline battery, the BluVac+ Pro sports a large 1/2″ numeric display and a bright blue backlight. 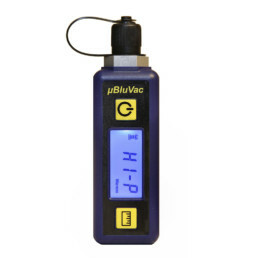 The BluVac+ Pro measures from 0—25,000 microns with 0.1 micron resolution below 10,000 microns. The BluVac+ Pro has two programming modes — Evacuation and Rise Time Testing — dramatically increasing your productivity on the job. Its Vacuum Leak Rate indicator shows both evacuation progress, and assists in determining the presence of leaks or moisture. Also included are Ambient and Saturation Temperature Indicators, accurate to within 0.2°F (0.1°C). The Evacuation Progress Indicator show increasing vacuum even while the pressure exceeds 25,000 Microns. Innovative Oil Sensor and Self-Diagnostics ensure accuracy. 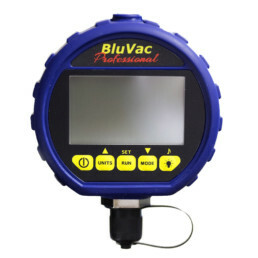 The BluVac series of digital vacuum gauges are the only field-calibratable vacuum gauges that require no special equipment for calibration.